Bill Loux replied to the topic 'TopHat classics' in the forum. Hey Dave, thanks, I replied PM to you on Defender Source but it wouldn't let me post a link there so I am trying to post the links here. 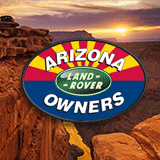 Bill Loux replied to the topic 'New to Land Rovers and considering buying a 110' in the forum. Thanks would love to meet up with any 110 owners and take a ride sometime. I see that there is a rally up in Sedona next week, would anyone be heading up there? Thinking about taking off work Friday and driving up and seeing if I can see more 110's and maybe get a feel for the ride on and off road. Is anyone heading up there? Bill Loux replied to the topic 'Re: TopHat classics' in the forum. Hey do you happen to be Dave Smith, former AF Combat Controller? Any idea what something like that refurbed would run for a new 110?